Anthony Davison has published on a wide range of topics in statistical theory and methods, and on environmental, biological and financial applications. His current main research interests are statistics of extremes, likelihood asymptotics, bootstrap and other resampling methods, and statistical modelling. Statistics of extremes concerns rare events such as storms, high winds and tides, extreme pollution episodes, sporting records, and the like. The subject has a long history, but under the impact of engineering and environmental problems has been an area of intense development in the past 15 years. Davison''s PhD work was in this area, in a project joint between the Departments of Mathematics and Mechanical Engineering at Imperial College, with the aim of modelling potential high exposures to radioactivity due to releases from nuclear installations. The key tools developed, joint with Richard Smith, were regression models for exceedances over high thresholds, which generalized earlier work by hydrologists, and formed the basis of some important later developments. This has led to an ongoing interest in extremes, and in particular their application to environmental and financial data. A major current interest is the development of suitable methods for modelling rare spatio-temporal events, particularly but not only in the context of climate change. Davison was principal investigator for a major project on this topic funded by the the CEPF and involving researchers from EPFL, ETHZ, WSL, SSS, and other institutions. Likelihood asymptotics too have undergone very substantial development since 1980. Key tools here have been saddlepoint and related approximations, which can give remarkably accurate approximate distribution and density functions even for very small sample sizes. These approximations can be used for wide classes of parametric models, but also for certain bootstrap and resampling problems. The literature on these methods can seem arcane, but they are potentially widely applicable, and Davison wrote a book joint with Nancy Reid and Alessandra Brazzale intended to promote their use in applications. Bootstrap methods are now used in many areas of application, where they can provide a researcher with accurate inferences tailor-made to the data available, rather than relying on large-sample or other approximations of doubtful validity. The key idea is to replace analytical calculations of biases, variances, confidence and prediction intervals, and other measures of uncertainty with computer simulation from a suitable statistical model. In a nonparametric situation this model consists of the data themselves, and the simulation simply involves resampling from the existing data, while in a parametric case it involves simulation from a suitable parametric model. There is a wide range of possibilities between these extremes, and the book by Davison and Hinkley explores these for many data examples, with the aim of showing how and when resampling methods succeed and why they can fail. Davison also has research links with the NCCR Plant Survival at the University of Neuchâtel, for which he leads a group of researchers undertaking statistical and dynamical modelling. The problems studied here are very varied, ranging from methods for the analysis of microarray data, through modelling the behaviour of wasps and moths, to assessment of the effects of grazing by cows in their pastures. He is Editor of Biometrika (2008-). Other editorial roles have been as Joint Editor of Journal of the Royal Statistical Society, series B (2000-2003), editor of the IMS Lecture Notes  Monograph Series (2007), Associate Editor of Biometrika (1987-1999), and Associate Editor of the Brazilian Journal of Probability and Statistics (1987  2006). He has served on several committees of Royal Statistical Society, including its Research Section Committee. He is an elected Fellow of the American Statistical Assocation and of the Institute of Mathematical Statistics, an elected member of the International Statistical Institute, and a Chartered Statistician. In 2009 he was awarded a laurea honoris causa in Statistical Science by the University of Padova, in 2011 he held a Francqui Chair at Hasselt University, and in 2012 he was Mitchell Lecturer at the University of Glasgow. In 2015 he received the Guy Medal in Silver of the Royal Statistical Society. Applications, particularly to environmental and biological data. H. Ruffieux / A. C. Davison; J. Hager (Dir.) : Large-scale variational inference for Bayesian joint regression modelling of high-dimensional genetic data. Lausanne, EPFL, 2019. DOI : 10.5075/epfl-thesis-9139. P. D. Le; A. C. Davison; S. Engelke; M. Leonard; S. Westra : Dependence properties of spatial rainfall extremes and areal reduction factors; Journal Of Hydrology. 2018-10-01. DOI : 10.1016/j.jhydrol.2018.08.061. A. C. Davison : 'The life of man, solitary, poore, nasty, brutish, and short': Discussion of the paper by Rootzen and Zholud; Extremes. 2018-09-01. DOI : 10.1007/s10687-018-0329-5. R. de Fondeville; A. C. Davison : High-dimensional peaks-over-threshold inference; Biometrika. 2018-09-01. DOI : 10.1093/biomet/asy026. R. G. T. M. M. de Deloÿe et Fourcade de Fondeville / A. C. Davison (Dir.) : Functional Peaks-Over-Threshold Analysis for Complex Extreme Events. Lausanne, EPFL, 2018. DOI : 10.5075/epfl-thesis-8927. P. Asadi; S. Engelke; A. Davison : Optimal regionalization of extreme value distributions for flood estimation; JOURNAL OF HYDROLOGY. 2018. DOI : 10.1016/j.jhydrol.2017.10.051. A. Zollinger; A. Davison; D. Goldstein : Automatic module selection from several microarray gene expression studies; BIOSTATISTICS. 2018. DOI : 10.1093/biostatistics/kxx032. T. Lugrin / A. C. Davison; J. A. Tawn (Dir.) : Semiparametric Bayesian Risk Estimation for Complex Extremes. Lausanne, EPFL, 2018. DOI : 10.5075/epfl-thesis-8349. H. Ruffieux; A. C. Davison; J. Hager; I. Irincheeva : Efficient inference for genetic association studies with multiple outcomes; Biostatistics. 2017. DOI : 10.1093/biostatistics/kxx007. L. Roquette : A Functional Framework for Enhanced Ultrasound Imaging ; 2017. L. Frossard / A. C. Davison (Dir.) : Contributions to Modelling Extremes of Spatial Data. Lausanne, EPFL, 2017. DOI : 10.5075/epfl-thesis-7479. J. L. Wadsworth; J. A. Tawn; A. C. Davison; D. M. Elton : Modelling across extremal dependence classes; Journal Of The Royal Statistical Society Series B-Statistical Methodology. 2017. DOI : 10.1111/rssb.12157. L. Roquette : ODE parameter estimation through a runner's model application ; 2016. E. Thibaud; J. Aalto; D. S. Cooley; A. C. Davison; J. Heikkinen : Bayesian Inference For The Brown-Resnick Process, With An Application To Extreme Low Temperatures; Annals of Applied Statistics. 2016. DOI : 10.1214/16-Aoas980. T. Lugrin; A. C. Davison; J. A. Tawn : Bayesian uncertainty management in temporal dependence of extremes; Extremes. 2016. DOI : 10.1007/s10687-016-0258-0. R. Huser; A. C. Davison; M. G. Genton : Likelihood estimators for multivariate extremes; Extremes. 2016. DOI : 10.1007/s10687-015-0230-4. T. Lugrin; A. C. Davison; J. A. Tawn : Bayesian Uncertainty Management in Temporal Dependence of Extremes; Extremes -Dordrecht-. 2016. X. Pedeli; A. C. Davison; K. Fokianos : Likelihood Estimation for the INAR(p) Model by Saddlepoint Approximation; Journal Of The American Statistical Association. 2015. DOI : 10.1080/01621459.2014.983230. V. Partovi Nia; A. C. Davison : A simple model-based approach to variable selection in classification and clustering; Canadian Journal Of Statistics-Revue Canadienne De Statistique. 2015. DOI : 10.1002/cjs.11241. A. C. Davison; R. Huser : Statistics of Extremes; Annual Review Of Statistics And Its Application, Vol. 2; Palo Alto: Annual Reviews, 2015. p. 203-235. A. Leboucq; A. C. Davison; D. Goldstein : Meta-analysis of incomplete microarray studies; Biostatistics. 2015. DOI : 10.1093/biostatistics/kxv014. E. Thibaud; B. Petitpierre; O. Broennimann; A. C. Davison; A. Guisan : Measuring the relative effect of factors affecting species distribution model predictions; Methods In Ecology And Evolution. 2014. DOI : 10.1111/2041-210X.12203. E. Thibaud / A. C. Davison (Dir.) : Contributions to Spatial Statistics. Lausanne, EPFL, 2014. DOI : 10.5075/epfl-thesis-6426. A. Leboucq / A. C. Davison; D. Goldstein (Dir.) : Meta-analysis of Incomplete Microarray Studies. Lausanne, EPFL, 2014. DOI : 10.5075/epfl-thesis-6371. M. De Carvalho; A. C. Davison : Spectral Density Ratio Models for Multivariate Extremes; Journal Of The American Statistical Association. 2014. DOI : 10.1080/01621459.2013.872651. A. C. Davison; D. A. S. Fraser; N. Reid; N. Sartori : Accurate Directional Inference for Vector Parameters in Linear Exponential Families; Journal Of The American Statistical Association. 2014. DOI : 10.1080/01621459.2013.839451. R. Huser; A. C. Davison : Space-time modelling of extreme events; Journal Of The Royal Statistical Society Series B-Statistical Methodology. 2014. DOI : 10.1111/rssb.12035. T. Lugrin : Bayesian Semiparametrics for Modelling the Clustering of Extreme Values ; 2013. E. Thibaud; R. Mutzner; A. C. Davison : Threshold modeling of extreme spatial rainfall; Water Resources Research. 2013. DOI : 10.1002/wrcr.20329. A. C. Davison; R. Huser; E. Thibaud : Geostatistics of Dependent and Asymptotically Independent Extremes; Mathematical Geosciences. 2013. DOI : 10.1007/s11004-013-9469-y. R. Huser / A. C. Davison (Dir.) : Statistical Modeling and Inference for Spatio-Temporal Extremes. Lausanne, EPFL, 2013. DOI : 10.5075/epfl-thesis-5946. R. Huser; A. C. Davison : Composite likelihood estimation for the Brown--Resnick process; Biometrika. 2013. DOI : 10.1093/biomet/ass089. H. E. Rieder; L. Frossard; M. Ribatet; J. Staehelin; J. A. Maeder et al. : On the relationship between total ozone and atmospheric dynamics and chemistry at mid-latitudes - Part 2: The effects of the El Nino/Southern Oscillation, volcanic eruptions and contributions of atmospheric dynamics and chemistry to long-term total ozone changes; Atmospheric Chemistry And Physics. 2013. DOI : 10.5194/acp-13-165-2013. L. Frossard; H. E. Rieder; M. Ribatet; J. Staehelin; J. A. Maeder et al. : On the relationship between total ozone and atmospheric dynamics and chemistry at mid-latitudes - Part 1: Statistical models and spatial fingerprints of atmospheric dynamics and chemistry; Atmospheric Chemistry And Physics. 2013. DOI : 10.5194/acp-13-147-2013. N. Dawes; M. Lehning; M. Bavay; S. Sofiane; I. Iosifescu et al. : Open Support Platform for Environmental Research (OSPER)-tools for the discovery and exploitation of environmental data. 2012. AGU Fall Meeting. A. C. Davison : Extremes: spatial parametric modeling; Encyclopedia of Environmetrics Second Edition; Chichester, UK: John Wiley, 2012. p. 984-990. V. Chavez-Demoulin; A. C. Davison : Modelling Time Series Extremes; Revstat-Statistical Journal. 2012. A. C. Davison; S. A. Padoan; M. Ribatet : Statistical Modeling of Spatial Extremes; Statistical Science. 2012. DOI : 10.1214/11-STS376. V. P. Nia; A. C. Davison : High-Dimensional Bayesian Clustering with Variable Selection: The R Package bclus; Journal Of Statistical Software. 2012. M. Sueveges; A. C. Davison : A case study of a "Dragon-King": The 1999 Venezuelan catastrophe; European Physical Journal-Special Topics. 2012. DOI : 10.1140/epjst/e2012-01566-6. C. Berclaz; J. Goulley; M. Villiger; A. Bouwens; E. Martin-williams et al. : Diabetes imaging — quantitative assessment of islets of Langerhans distribution in murine pancreas using extended-focus optical coherence microscopy; Biomedical Optics Express. 2012. DOI : 10.1364/BOE.3.001365. J. Blanchet; A. C. Davison : Statistical modelling of ground temperature in mountain permafrost; Proceedings Of The Royal Society A-Mathematical Physical And Engineering Sciences. 2012. DOI : 10.1098/rspa.2011.0615. N. Dawes; M. Bavay; T. Egger; S. Sarni; A. Salehi et al. : From sensor networks to connected analysis tools. 2012. European Geosciences Union General Assembly 2012, Vienna, Austria, April 22-27, 2012. M. Ribatet; D. Cooley; A. C. Davison : Bayesian inference from composite likelihoods, with an application to spatial extremes; Statistica Sinica. 2012. DOI : 10.5705/ss.2009.248. A. C. Davison; M. M. Gholamrezaee : Geostatistics of extremes; Proceedings of the Royal Society of London Series A: Mathematical and Physical Sciences. 2012. DOI : 10.1098/rspa.2011.0412. E. Zenklusen Mutter / A. C. Davison; M. Phillips (Dir.) : Statistical Analysis of Mountain Permafrost Temperatures. Lausanne, EPFL, 2012. DOI : 10.5075/epfl-thesis-5270. A. C. Davison : Discussion of the papers by Dankers and Feyen, Cooley, and Keef. 2011. International Statistical Institute, Dublin, Ireland, August 21-26, 2011. J. Ferrez; A. C. Davison; M. Rebetez : Extreme temperature analysis under forest cover compared to an open field; Agricultural And Forest Meteorology. 2011. DOI : 10.1016/j.agrformet.2011.03.005. V. Chavez-Demoulin; A. C. Davison; L. Frossard : Discussion of `Threshold modelling of spatially dependent non-stationary extremes with application to hurricane-induced wave heights' by P. J. Northrop and P. Jonathan; Environmetrics. 2011. DOI : 10.1002/env.1125. J. Blanchet; A. C. Davison : Spatial modelling of extreme snow depth; Annals of Applied Statistics. 2011. DOI : 10.1214/11-AOAS464. Y. Ruffieux; A. C. Davison : Hierarchical wavelet modelling of environmental sensor data; Brazilian Journal of Probability and Statistics. 2011. DOI : 10.1214/11-BJPS154. A. C. Davison; I. Ricard : Comparison of Models for Olfactometer Data; Journal of Agricultural, Biological, and Environmental Statistics. 2011. DOI : 10.1007/s13253-010-0042-6. M. Lovric; A. C. Davison : Statistics of extremes; International Encyclopedia of Statistical Science; new York: Springer, 2011. p. 1484--1487. L. Shi; G. Campbell; W. D. Jones; F. Campagne; Z. Wen et al. : The MicroArray Quality Control (MAQC)-II study of common practices for the development and validation of microarray-based predictive models; Nature Biotechnology. 2010. DOI : 10.1038/nbt.1665. L. Shi; G. Campbell; W. D. Jones; F. Campagne; Z. Wen et al. : The MicroArray Quality Control (MAQC)-II study of common practices for the development and validation of microarray-based predictive models; Pharmacogenomics Journal. 2010. DOI : 10.1038/nbt.1665. H. E. Rieder; J. Staehelin; J. A. Maeder; T. Peter; M. Ribatet et al. : Extreme events in total ozone over Arosa---Part 2: Fingerprints of atmospheric dynamics and chemistry and effects on mean values and long-term changes; Atmospheric Chemistry and Physics. 2010. DOI : 10.5194/acp-10-10033-2010. H. E. Rieder; J. Staehelin; J. A. Maeder; T. Peter; M. Ribatet et al. : Extreme events in total ozone over Arosa---Part 1: Application of extreme value theory; Atmospheric Chemistry and Physics. 2010. DOI : 10.5194/acp-10-10021-2010. A. Costa; I. Ricard; A. C. Davison; T. C. J. Turlings : Effects of Rewarding and Unrewarding Experiences on the Response to Host-induced Plant Odors of the Generalist Parasitoid Cotesia marginiventris (Hymenoptera: Braconidae); Journal of Insect Behavior. 2010. DOI : 10.1007/s10905-010-9215-y. M. M. Gholam Rezaee / A. C. Davison (Dir.) : Geostatistics of Extremes. Lausanne, EPFL, 2010. DOI : 10.5075/epfl-thesis-4844. C. Lozada-Can; A. C. Davison : Three Examples of Accurate Likelihood Inference; American Statistician. 2010. DOI : 10.1198/tast.2010.09004. M. Süveges; A. C. Davison : Model misspecification in peaks over threshold analysis; The Annals of Applied Statistics. 2010. DOI : 10.1214/09-AOAS292. V. Partovi Nia / A. C. Davison (Dir.) : Fast high-dimensional Bayesian classification and clustering. Lausanne, EPFL, 2009. DOI : 10.5075/epfl-thesis-4482. T. Clerc; A. C. Davison; L.-F. Bersier : Stochastic modelling of prey depletion processes; Journal of Theoretical Biology. 2009. DOI : 10.1016/j.jtbi.2009.04.017. A. C. Davison; D. Mastropietro : Saddlepoint approximation for mixture models; Biometrika. 2009. DOI : 10.1093/biomet/asp022. M. Süveges / A. C. Davison (Dir.) : Statistical analysis of clusters of extreme events. Lausanne, EPFL, 2009. DOI : 10.5075/epfl-thesis-4312. C. Ancey; A. C. Davison; T. B. Böhm; M. Jodeau; P. FREY : Entrainment and motion of coarse particles in a shallow water stream down a steep slope; Journal of Fluid Mechanics. 2008. DOI : 10.1017/S0022112007008774. A. R. Brazzale; A. C. Davison : Accurate parametric inference for small samples; Statistical Science. 2008. DOI : 10.1214/08-STS273. A. C. Davison; N. Sartori : The Banff challenge: Statistical detection of a noisy signal; Statistical Science. 2008. DOI : 10.1214/08-STS260. I. Ricard / A. C. Davison (Dir.) : Statistical methods for insect choice experiments. Lausanne, EPFL, 2008. DOI : 10.5075/epfl-thesis-4020. A. C. Davison : Some challenges for statistics; Statistical Methods and Applications. 2007. DOI : 10.1007/s10260-007-0079-z. A. Verdon; N. Margraf; A. C. Davison; M. Rahier; R. E. Naisbit : Conserved oviposition preferences in alpine leaf beetle populations despite host shifts and isolation; Ecological Entomology. 2007. DOI : 10.1111/j.1365-2311.2006.00842.x. M.-O. Boldi; A. C. Davison : A mixture model for multivariate extremes; Journal of the Royal Statistical Society, series B. 2007. DOI : 10.1111/j.1467-9868.2007.00585.x. T. Fabbro; A. C. Davison; T. Steinger : Reliable confidence intervals in quantitative genetics: Narrow-sense heritability; Theoretical and Applied Genetics. 2007. DOI : 10.1007/s00122-007-0619-9. A. Chaudhary; V. Partovi Nia; A. C. Davison : Some Basic Functions for Tree Representations of Bayesian Markov Chain Monte Carlo Clustering. 2007. Y. Ruffieux; A. C. Davison : Hierarchical wavelet modelling of environmental sensor data. 2007. G. Messerli; V. Partovi Nia; M. Trevisan; A. Kolbe; N. Schauer et al. : Rapid Classification of Phenotypic Mutants of Arabidopsis via Metabolite Fingerprinting; Plant Physiology. 2007. DOI : 10.1104/pp.106.090795. 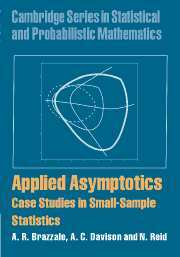 A. R. Brazzale; A. C. Davison; N. Reid : Applied Asymptotics: Case Studies in Small-Sample Statistics ; Cambridge: Cambridge University Press. A. C. Davison; S. Sardy : Resamping variance estimation in surveys with missing data; Journal of Offical Statistics. 2007. I. Ricard; A. C. Davison : Statistical inference for olfactometer data; Applied Statistics. 2007. DOI : 10.1111/j.1467-9876.2007.00588.x. M. Suveges; A. C. Davison : Clustering of extreme temperatures from 1772 to 2004 ; Global Change Day 2006, Bern, Switzerland, 20 April 2006. A. C. Davison; S. Sardy : Méthodes de rééchantillonnage pour l'estimation de variance; Journal de la Société Française de Statistique. 2006. A. J. Canty; A. C. Davison; D. V. Hinkley; V. Ventura : Bootstrap diagnostics and remedies; Canadian Journal of Statistics. 2006. A.-F. Bourquin; M. Süveges; M. Pertin; N. Gilliard; S. Sardy et al. : Assessment and analysis of mechanical allodynia-like behaviour induced by spared nerve injury (SNI) in the mouse; Pain. 2006. DOI : 10.1016/j.pain.2005.10.036. C. Tamò; I. Ricard; M. Held; A. C. Davison; T. C. J. Turlings : A comparison of naive and conditioned responses of three generalist endoparasitoids of lepidopteran larvae to host-induced plant odours; Animal Biology. 2006. M.-A. Moravie; A. C. Davison; D. Pasquier; P.-J. Charmillot : Bayesian forecasting of grape moth emergence; Ecological Modelling. 2006. D. Bhowmick; A. C. Davison; D. R. Goldstein; Y. Ruffieux : A Laplace mixture model for the identification of differential expression in microarrays; Biostatistics. 2006. DOI : 10.1093/biostatistics/kxj032. A. C. Davison; D. A. S. Fraser; N. Reid : Improved likelihood inference for discrete data; Journal of the Royal Statistical Society series B. 2006. DOI : 10.1111/j.1467-9868.2006.00548.x. C. Osinski / A. C. Davison (Dir.) : Bayesian risk analysis of financial time series. Lausanne, EPFL, 2006. DOI : 10.5075/epfl-thesis-3470. A. Biedermann; F. Taroni; O. Delemont; C. Semadeni; A. C. Davison : The evaluation of evidence in the forensic investigation of fire incidents (Part II): Practical examples of the use of Bayesian networks; Forensic Science International. 2005. A. Biedermann; F. Taroni; O. Delemont; C. Semadeni; A. C. Davison : The evaluation of evidence in the forensic investigation of fire incidents (Part I): An approach using Bayesian networks; Forensic Science International. 2005. A. C. Davison; Y. Dodge; N. Wermuth : Celebrating Statistics: Papers in Honour of Sir David Cox on the Occasion of his 80th Birthday ; Oxford, UK: Oxford University Press. A. J. Canty; A. C. Davison : Bootstrap methods; Encyclopedia of Statistics in the Behavioural Sciences; Wiley, 2005. p. 169-176. V. Chavez-Demoulin; A. C. Davison; A. J. McNeil : A point process approach to value-at-risk estimation; Quantitative Finance. 2005. DOI : 10.1080/14697680500039613. V. Chavez-Demoulin; A. C. Davison : Generalized additive models for sample extremes; Applied Statistics. 2005. A. Davison; S. Sardy : Resampling-based variance estimation in DACSEIS with application to the Swiss Household Budget Survey. 2004. T. C. J. Turlings; C. Tamo; A. C. Davison : A six-arm olfactometer permitting simultaneous observation of insect attraction and odour trapping; Physiological Entomology. 2004. DOI : 10.1111/j.1365-3032.2004.0362.x. C. Semadeni; A. C. Davison; D. V. Hinkley : Posterior probability intervals in Bayesian wavelet estimation; Biometrika. 2004. DOI : 10.1093/biomet/91.2.497. A. C. Davison; F. Dorsaz : Order statistics; Encyclopedia of Biostatistics; Wiley, 2004. p. online edition. A. C. Davison : Normal Scores; Encyclopedia of Biostatistics; Wiley, 2004. p. online edition. A. C. Davison : Extreme values; Encyclopedia of Biostatistics; Wiley, 2004. p. online edition. M.-O. Boldi / A. C. Davison (Dir.) : Mixture models for multivariate extremes. Lausanne, EPFL, 2004. DOI : 10.5075/epfl-thesis-3098. A. C. Davison; S. Sardy : Resampling-based variance estimation in DACSEIS; Bulletin of the International Statistical Institute: Data quality in complex surveys, Berlin. 2003. A. C. Davison; C. Semadeni : Discussion of Wakefield, J. (2004) Ecological inference for 2x2 tables; Journal of the Royal Statistical Society series A. 2003. A. C. Davison : Discussion of Kong, A., McCullagh, P., Nicolae, D., Tan, Z., and Meng, X.-L. (2003) A theory of statistical models for Monte Carlo integration; Journal of the Royal Statistical Society series B. 2003. M.-O. Boldi; A. C. Davison : Discussion of Heffernan, J. and Tawn, J. A. (2004) A conditional approach for multivariate extreme values; Journal of the Royal Statistical Society series B. 2003. O. C. Ukoumunne; A. C. Davison; M. C. Gulliford; S. Chinn : Non-parametric bootstrap confidence intervals for the intraclass correlation coefficient; Statistics in Medicine. 2003. DOI : 10.1002/sim.1643. D. R. Cox; D. Commenges; A. C. Davison; P. J. Solomon; S. R. Wilson : The Oxford Dictionary of Statistical Terms; The Oxford Dictionary of Statistical Terms; Oxford University Press, 2003. A. C. Davison; D. V. Hinkley; G. A. Young : Recent developments in bootstrap methodology; Statistical Science. 2003. 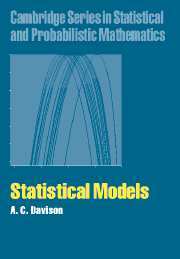 A. C. Davison : Statistical Models ; Cambridge: Cambridge University Press. C. Candolo; A. C. Davison; C. G. B. Demétrio : A note on model uncertainty in linear regression; The Statistician. 2003. A. C. Davison; D. Kuonen : An introduction to the bootstrap with applications in R; Statistical Computing and Graphics Newsletter. 2002. B. Caffo; J. G. Booth; A. C. Davison : Empirical supremum rejection sampling; Biometrika. 2002. DOI : 10.1093/biomet/89.4.745. N. I. Ramesh; A. C. Davison : Local models for exploratory analysis of hydrological extremes; Journal of Hydrology. 2002. A. C. Davison; S. Wang : Saddlepoint approximations as smoothers; Biometrika. 2002. DOI : 10.1093/biomet/89.4.933. A. C. Davison : Biometrika centenary: Theory and general methodology; Biometrika. 2001. DOI : 10.1093/biomet/88.1.13. A. C. Davison : Regression diagnostics; Encyclopedia of Environmetrics; Wiley, 2001. p. 1728-1733. G. Capkun; A. C. Davison; A. Musy : A Robust Rainfall-Runoff Transfer Model; Water Resources Research. 2001. DOI : 10.1029/2001WR000295. D. Kuonen / A. C. Davison (Dir.) : Computer-intensive statistical methods. Lausanne, EPFL, 2001. DOI : 10.5075/epfl-thesis-2449. A. J. Canty; A. C. Davison : Contribution to the discussion of `The estimating function bootstrap' by F. Hu and J. D. Kalbfleisch; Canadian Journal of Statistics. 2000. A. C. Davison; F. Louzada-Neto : Inference for the poly-Weibull model; The Statistician. 2000. A. C. Davison; N. I. Ramesh : Local likelihood smoothing of sample extremes; Journal of the Royal Statistical Society series B. 2000. D. B. Percival; S. Sardy; A. C. Davison : Wavestrapping time series: Adaptive wavelet-based bootstrapping; Nonlinear and Nonstationary Signal Processing; Cambridge University Press, 2000. p. 442-471. A. Röhrl / A. C. Davison (Dir.) : Parallel processing in statistical computation. Lausanne, EPFL, 2000. DOI : 10.5075/epfl-thesis-2273. A. R. Brazzale / A. C. Davison (Dir.) : Practical small-sample parametric inference. Lausanne, EPFL, 2000. DOI : 10.5075/epfl-thesis-2230. A. J. Canty; A. C. Davison : Resampling-based variance estimation for labour force surveys; The Statistician. 1999. A. C. Davison; H. Friedl; A. Berghold; G. Kauermann : The bootstrap: A tutorial. 1999. p. 10-18. V. Chavez / A. C. Davison (Dir.) : Two problems in environmental statistics. Lausanne, EPFL, 1999. DOI : 10.5075/epfl-thesis-2082. A. J. Canty; A. C. Davison : Implementation of saddlepoint approximations in resampling problems; Statistics and Computing. 1998. A. C. Davison : Extreme values; Encyclopedia of Biostatistics; Wiley, 1998. p. 1463-1467. A. C. Davison; D. V. Hinkley : Bootstrap Methods and Their Application ; Cambridge: Cambridge University Press. A. C. Davison; N. I. Ramesh : Some models for discretized series of events; Journal of the American Statistical Association. 1996. A. J. Canty; A. C. Davison; D. V. Hinkley : Reliable confidence intervals. Discussion of ``Bootstrap confidence intervals'', by T. J. DiCiccio and B. Efron; Statistical Science. 1996. A. J. Canty; A. C. Davison; L. Billard; N. I. Fisher : Implementation of saddlepoint approximations to bootstrap distributions. 1996. p. 248-253. A. Ancey; A. Davison; T. Böhm; M. Jodeau; P. Frey : Entrainment and motion of coarse particles in a shallow water stream down a steep slope. Le cours donne une initiation à la théorie des probabilités et aux méthodes statistiques pour physiciens. Un premier cours en analyse statistique de séries temporelles et ses applications. Un deuxième cours sur les modèles de régression, traitant des effets non-linéaires, et les variables dépendantes non-gaussiennes et dépendantes. La modélisation des événements rares est devenu un domaine important de la statistique. Ce cours donnera un survol de ce sujet riche, y compris les bases mathématiques, les outils et méthodes statistques, et des applications.